Today we’d like to introduce you to Kerry Hopkins. Thanks for sharing your story with us Kerry. So, let’s start at the beginning and we can move on from there. I started working for Leni’s Textiles after college in 1982 as a handweaver. The company was owned at the time by Ms. Leni Joyce, who was an interior decorator in the Boston area, as well as the owner of a showroom in The Boston Design Center. I continued working with the company, often weaving at home, as I raised three children. In 1999 the mill moved from Watertown to Canton and at that time, I became Production Manager and Senior Designer. I took on the role of Vice President in 2007. This past January, I bought the company from Leni’s son, Mark Albion, and became President & CEO. Leni’s, Inc. Textiles weaves luxury upholstery fabrics for the private aircraft industry, as well as high-end interior design firms. We feature over 200 styles of fabric in our line and can also custom design material to a customers’ specification, changing colors, fiber content and pattern as needed. Leni’s prides itself on creating flawless, excellent fabric but of course, there has been times where not everything has gone smoothly. We manufacture each fabric as we receive the purchase order, and secure the required yarns when the order is placed. Our vendors have been wonderful partners to us throughout the years but yarns go out of stock, change dyelot colors and get discontinued. When this happens, it is quite a challenge to manage our quality control and on time delivery date. The corporate aircraft industry can be inflexible about when they need to receive their fabric, because when a plane is grounded and in the hanger, the fabric needs to be there for installation. Leni’s Textiles – what should we know? What do you guys do best? What sets you apart from the competition? Leni’s Textiles has been in the fine fabric business since 1972. We specialize in upholstery material but also make luxury blanket throws, to complement our fabric styles. Because we are custom manufacturers, we can recreate discontinued fabrics that our customers need, as well as design new patterns to blend with an interior scheme. Leni’s handweaves cowhide leather, mixed with rayon chenille and other fibers, to create a most unique and unusual material. We have also woven 100% lambskin fabric for use in apparel by Plymouth clothing designer, Eileen Steward. Leni’s fabrics are made and sourced in the USA. Our overstock yarn is donated to local weaving schools, girl scout troops, and elementary schools. Our excess fabric runs have been made into blanket throws and donated to Rosie’s Place in Boston. Our fabrics are eco-friendly and manufactured with natural fibers, including cotton, wool, bamboo, and rayon chenille. We are set apart by our remarkable customer service, creativity and reliability. Success for me is each flawless order that we produce. As a fabric designer, I work with luxury yarns in nearly endless color combinations, creating patterns that can be changed and enriched with the passing of a shuttle through the warp yarn. I manufacture material with a goal of perfection, and when that is achieved it is the most gratifying work I can imagine. My vision for future success includes solidifying my relationship to my customer base, connecting with new clients and streamlining the manufacturing process. Congratulations and continued success to you Kerry !!!! Congrats! So happy for you. Well deserved! Congratulations Kerry! 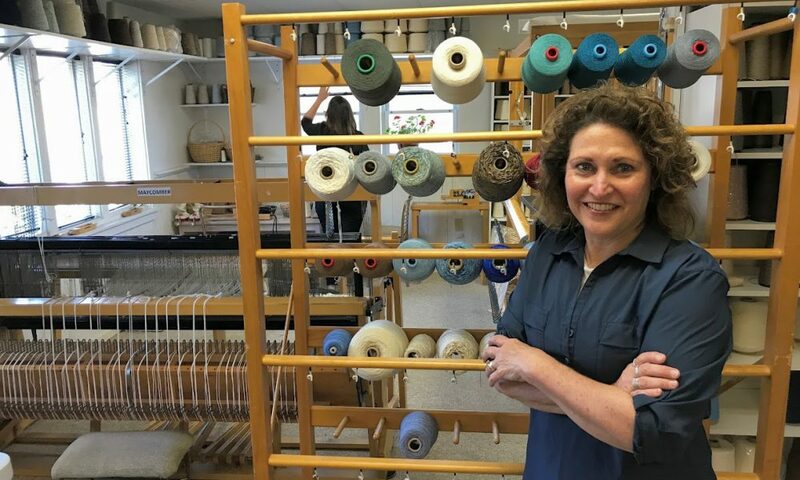 As Leni’s first weaver in the Wellesley basement, I’m thrilled that the business has a future with you at the helm. Keep those shuttles flying and keep creating beautiful handwoven fabrics!